The LG Ericsson LDP 7016D phone is the executive model in the LDP-7000 series digital range. It’s designed for heavy phone users, executives and managers. With 16 easy to use programmable buttons and a host of features it is a very good handset and one of the most popular in the LG digital range. For detailed information about the LG Aria LDP-7016 digital phone please read below. The LG Aria LDP 7016D phone is an executive model phone handset that employs navigation keys and a menu system to utilise more complex phone features. It may sound complex but they actually make the phone very easy to navigate and use on a daily basis. The navigation key (the silver round button) makes it easy to find speed dial numbers and use other functions. The 7016 is exactly the same as the flagship LDP-7024 model, expect for the fact that it has 8 fewer programmable buttons. If you're looking for an identical version of this handset that also unlocks all the IP features of your phone system, take a look at the popular 7016 IP handset. If your application is for the latest iPECS phone system then check out the LIP 8012 phone or LG LIP 8024D phones as they are the closest alternatives. Like all LDP 7000 series handsets, the LG Aria 7016 looks great and is incredibly easy to use. Part of its simplicity comes from the 16 programmable keys that can be tailored to suit the user. These buttons can be used to identify which staff are on the phone and which are free, configured as speed dials or to show what lines are currently in use. They can even be set to page the office or as a remote door release. It's this kind of flexibility that makes the 7000 series such popular handsets. The other advantage to the 7016 programmable buttons is the fact that any function you assign can be activated with a single touch. For example, let's say you want to transfer a call to a colleague. You'd simply look at their assigned button to see if they were free or not, then hit that button to call them. Hang up and the call is transferred! Given the huge storage capacity of the phone, LG Ericsson has provided the phone user with a handy jog dial to help you quickly navigate your 100's, even 1000's, of stored contacts. The jog dial is very intuitive to use, making operation a breeze. Another intuitive feature of the 7016 is the 3 menu buttons that are just below the screen. As you use the phone, relevant menu choices are displayed depending on what you are doing at the time. For example, if you're accessing voicemail, these buttons will offer you voicemail commands like replay, delete etc on screen. When on a call however, those options will change to present menu choices such as transfer, conference or mute. It's very smart and helps you get more out of the phone's advanced features. It's worth noting that most staff won't need an executive handset. Save its advanced features (and your budget) for power users such as your receptionist or managers - essentially anyone that needs the visibility of 16 staff or other features. 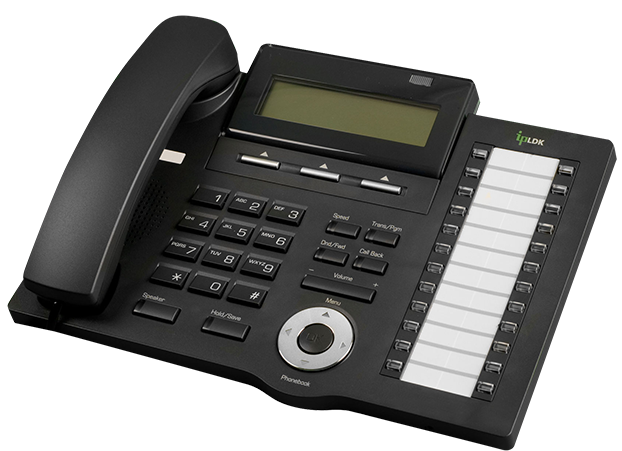 The LG LDP 7008 phone is the most popular in a typical phone system deployment for this reason. Remember, handsets are the biggest cost component of a phone system so by restricting the right handsets to the right users, you'll save big bucks. The 7016 phone handset is part of the LG Ericsson 7000 digital phone seriesand it's compatible with all of the existing previous LG Ericsson models (LG Aria 24IPE, LG Aria130c, LG Aria 130, LG Aria 300 and the LG Aria 600) as well as the latest LG iPECS pbx system solutions. If you're looking at handsets to go with the latest LG iPECS or the smaller LG Ericsson SBG-1000 phone system then you really should look at the new 8000 IP series and the LG LIP-8012 phone or LG LIP-8024D are probably the closest models in terms of general feature sets. They're IP and offer the latest technology like gigabit networking and more.